Are you looking for new challenges in the world of business? Do you want to set up a company in another EU country? Are you thinking of expanding your business abroad? 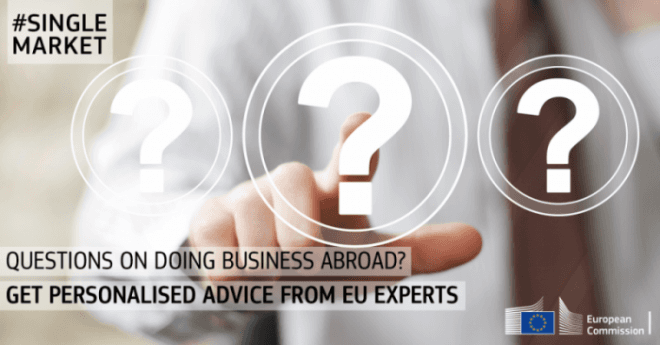 On Monday 26 February Your Europe Advice legal experts will answer all your questions on how to set up a business in the EU, how to pay taxes, how to hire staff, how to get funding and many more. The platform is open! Submit your question now on the wall and our experts will reply next Monday between 11.00-13.00 CET. Our experts can reply to your questions in English, French, German, Italian, Polish, Bulgarian, Greek, Swedish and Danish. Don´t miss it! Click on “Interested” or “Join” on the Facebook chat to receive a notification when it starts.